August is here with the dog days of summer. The cicadas are singing their wings off in the trees each night, but the pollinators are in full force across the summertime perennials. I have seen the many more monarchs in the past week than in the the previous months combined. With all these pollinators buzzing around, it is necessary to add perennials to your yard and garden that they can visit and land on. I like to mixed annuals and perennials into the beds surrounding my vegetable garden, to get the most out of my crops, from the visiting insects. Below are 5 outstanding perennials for pollinators in August. 1. Heliopsis helianthoides aka False Sunflower Cultivars include: ‘Summer Sun’ ‘Summer Nights’ ‘Ballerina’ ‘Loraine Sunshine’ False sunflower is a native perennials growing in all sorts of conditions, from slightly wet soils to dry prairies. It likes full sun, and does well in a mixed planting of prairie natives & grasses, or by itself in massing. It readily reseeds itself in rich garden soils. False sunflower is drought tolerant and grows 3 to 5 feet tall and wide. It blooms from June to September. 2. Liatris aspera aka Button or Rough Blazingstar This native perennial comes from the dry prairies of the Great Plains. It is a tough perennial, growing in very dry to slightly moist soils, in full sun to part shade. This native should be mixed into a planting of grasses or other perennials, as it tends to flop by itself. It grows 3 to 6 feet tall and 1 foot wide. The purple flowers are borne along a tall spike during the month of August. 3. Rudbeckia triloba aka Brown-Eyed Susan Cultivars Include: ‘Red Sport’ ‘Prairie Glow’ This native perennial is short lived, almost a biennial, but reseeds vigorously into the garden once established. It prefers moist soils and can be found growing in part shade to full sun along streambanks. However, it is very drought tolerant and will grow just about anywhere in the garden. The yellow and brown flowers are borne all along a tall stem, from late July to October. It grows 3 to 8 feet tall and 3 feet wide. 4. Agastache foeniculum ‘Blue Fortune’ This tall perennial is a one of the best sources for pollen and nectar in the hot summer days. The tall flowers reach 4 to 10 feet tall and 3 to 6 feet wide. This large native will grow best in full sun and is very drought tolerant. 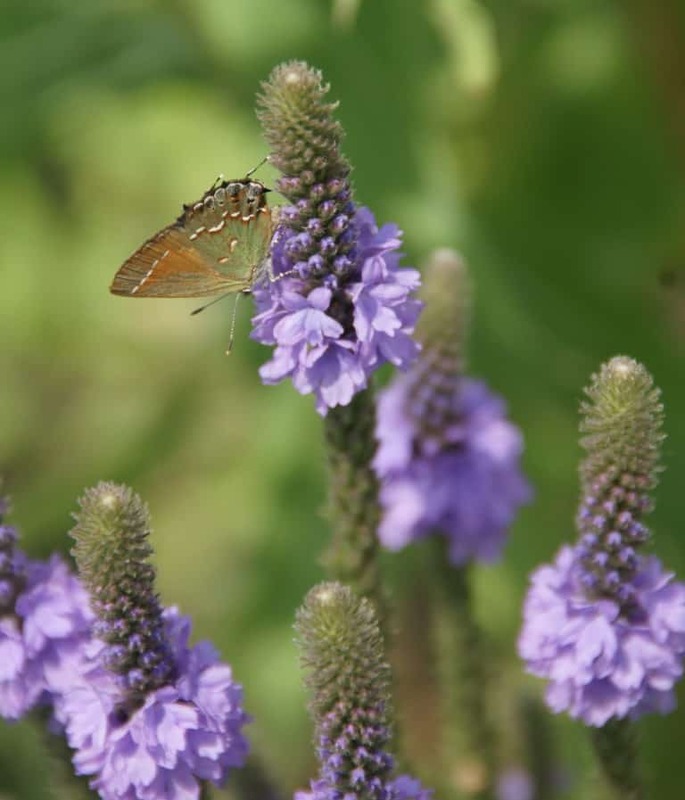 The blue to purple flowers are very attractive to a large variety of pollinators. 5. Verbena stricta aka Woolly Verbena This native perennial can be seen growing along roadsides, in ditches and fields, and in prairies and pastures. The tall, purple flower spikes are a favorite of bees and butterflies alike. It is extremely drought tolerant, and will grow well in full sun to part shade. The plants with flowers grow 3 to 6 feet tall and 2 to 3 feet wide. They grow well by themselves or mixed into a planting or mass.